Paphiopedilum armeniacum was described as recently as 1982, and many have wondered how such a striking species could have remained undiscovered for so long. It was given the name 'armeniacum' in reference to the apricot-coloured flowers of the first officially described specimen (a collection by A.L. Zhang from Bijiang in Yunnan). In contrast to this original observation, almost all subsequent specimens found have had sulphur-yellow flowers, hence the common name - golden slipper orchid - is perhaps more appropriate. 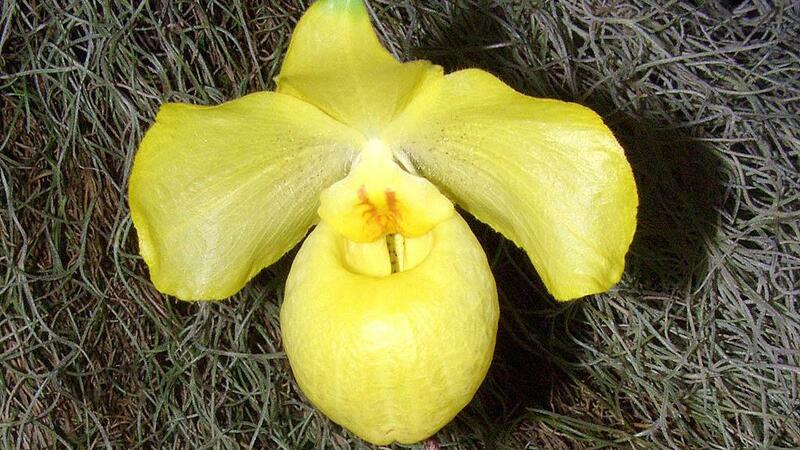 The endangered golden slipper orchid is highly prized as an ornamental. 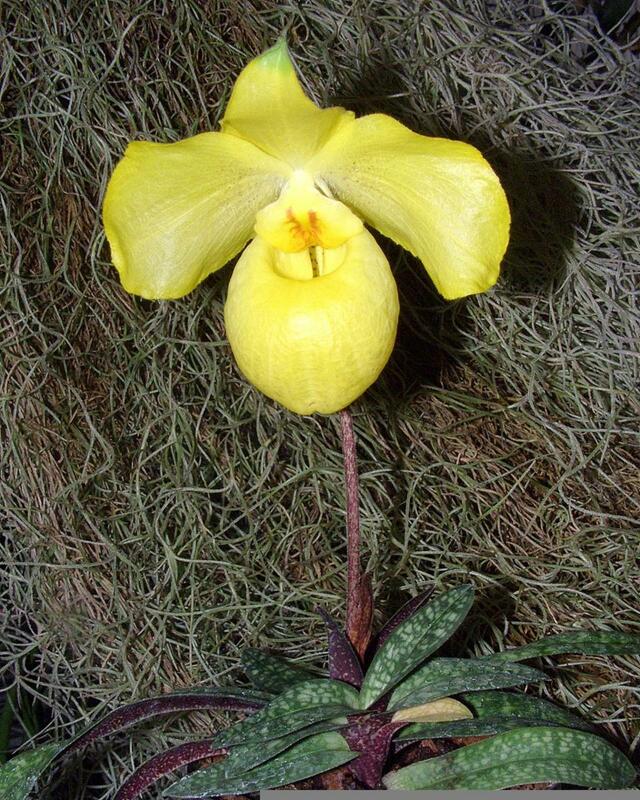 Paphiopedilum armeniacum is found from China (west Yunnan province) to northern Myanmar. It occurs at 1,600 to 2,000 metres above sea level. It is found growing on limestone hills, in semi-shaded deciduous forest, usually on cliffs above rivers. Paphiopedilum armeniacum has elongated rhizomes (horizontal underground stem), which grow up to 25 cm long, usually spreading through leaf litter or around rocks and forming large clumps. Plantlets occur up to 15 cm apart and each bears 5 to 7 leaves. The upper surface of the leaves is greenish-white with a dark green marbled pattern. The lower leaf surface is heavily spotted with irregular dark purple-red patches, and the edges of the leaves are finely serrated. This species flowers from late autumn to early spring. The large, sulphur-yellow flowers are borne singly on a peduncle (flower stalk) that can be up to 60 cm long. The peduncle is green with purple spots, and with brown hairs covering the surface. The flowers can be up to 10.5 cm in diameter and are spotted purple-crimson inside the lip, which is in the form of a large, rounded pouch. This species is rated by the IUCN (International Union for Conservation of Nature) as Endangered, and has in the past been collected from the wild in large numbers. Its limited geographical range, and popularity in cultivation, mean it is vulnerable to over-collection. Like all species of Paphiopedilum , it is listed on CITES Appendix I, meaning that trade in wild collected plants is prohibited. 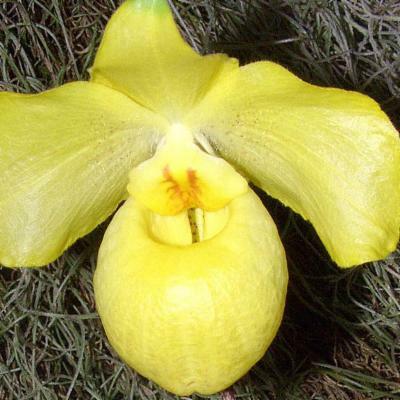 The large yellow flowers and attractive marbled leaves make Paphiopedilum armeniacum a highly sought-after ornamental plant. Commercial orchid growers have produced several inter-specific and inter-generic hybrids using this species. Paphiopedilum armeniacum is relatively easy to cultivate, but needs a dryish winter period (misted only), alongside increased light intensity, to encourage flowering. It thrives in strong, diffused light and cool, moist air at 60 to 80% relative humidity. Plants should be kept moist whilst actively growing. The use of fertiliser should be reduced, or halted, during the rest period. This species produces new shoots at the end of a long rhizome, which should be borne in mind when potting up plants. This orchid has been awarded First Class Certificates by, amongst others, the American Orchid Society and Royal Horticultural Society. Paphiopedilum armeniacum hybrids can sometimes be seen in the Princess of Wales Conservatory during the annual Tropical Extravaganza festival, held in February and March. Limestone cliffs and slopes, at elevations of 1,000 to 2,000 m above sea level, where it is subjected to constant light fog in the winter and heavy rain in the summer. Rated by the IUCN as Endangered, with a decreasing population trend. Listed on CITES Appendix I. China (western Yunnan only); 1200–2050 m.
A lithophytic or terrestrial herb with well-spaced growths up to 15 cm apart on an elongate rhizome. Leaves 5–7, oblong, obtuse or acute, tridenticulate at apex, 6–15 cm long, 1.8–2.5 cm wide, strongly marbled dark and light bluish green above, densely purple-spotted below, serrulate on margins. Inflorescence 1-flowered; peduncle 23–60 cm long, green, spotted with purple, brownpubescent; bract conduplicate, lanceolate-ovate, subacute to acute, about 1.5 cm long, green, spotted purple, pubescent. Flower very large for size of plant, 6–11 cm across, bright golden yellow with red veins on the staminode, spotted purple inside lip, pubescent on inside and outside; pedicel and ovary 3–3.5 cm long, green, pubescent, rostrate at apex. Dorsal sepal ovate, subacute, 2.2–5 cm long, 1.4–3.3 cm wide, pubescent near the base. Synsepal ovate, obtuse, 2–3.5 cm long, 1.8–2.6 cm wide, bicarinate on outside. Petals ovate to subcircular, rounded to subacute at apex, 2.8–5.5 cm long, 2.5–4.4 cm wide, ciliate, pubescent at base. Lip very inflated, thin-textured, large, 4–6.5 cm long, 2.2–5.2 cm wide, with margins incurved, white-pubescent and purple-dotted inside at base. Staminode large, convex, cordate, acute, 10–22 mm long and wide. 2n = 26. Perner, H. (1999). The bitter sea turns sweet: Paphiopedilum armeniacum in its natural habitat. Orchid Dig. 63(1): 27-30. Braem, G.J., Baker, C.O. & Baker, M.L. (1998). The Genus Paphiopedilum. Botanical Publishers Inc.
Cribb, P. (1998). The Genus Paphiopedilum (2nd Edition). Natural History Publications (Borneo). Hennessy, E.F. & Hedge, T.A. (1989). The Slipper Orchids. Acorn Books. Cribb, P.J. The Genus Paphiopedilum. 437 (Natural History Publications: Borneo, Malaysia, 1998). Chen, S.C. & Liu, F.Y. 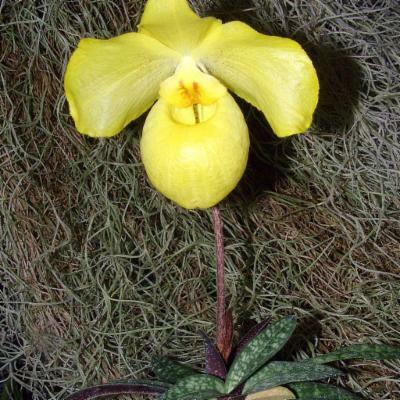 Original description of Paphiopedilum armeniacum. 4, (1982).